George Bolthoff began drag racing his street-driven '32 Ford at Santa Ana in 1951, then drove several stockers, including a Super Stock '57 Chevy that was converted to a C/Gas entry in 1959. 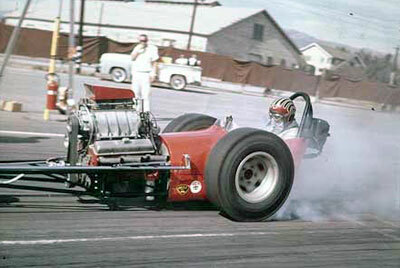 Bolthoff later placed the injected engine into a B/A chassis that won class honors at the NHRA Nationals in 1960. 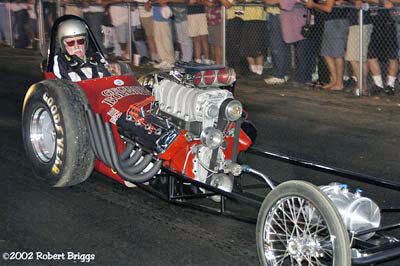 The same engine was later used in a dragster chassis to begin Bolthoff's Top Gas career. 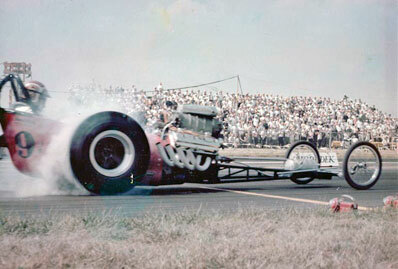 In late 1961 Bolthoff wanted to use more of his engineering skills and campaign a serious dragster. 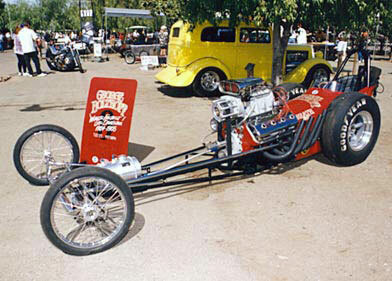 The chassis was completed in late 1962 by Kent Fuller and the body was made by Doug Kruse. 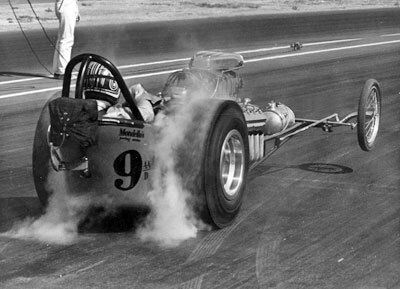 By June of 1963, with Ronnie Hampshire driving, the car made its first run at the Fontana, Ca. 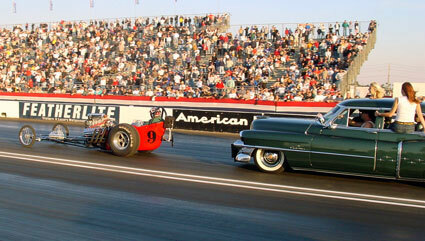 drag strip. However, Hampshire was soon drafted into the Army and Bolthoff took over the drivers seat in late 1963 and never left. 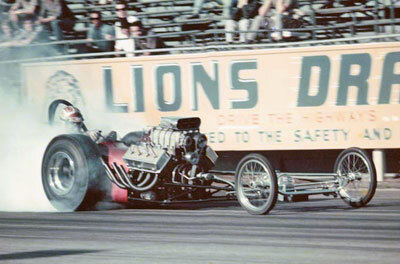 Taken in 1963 at the Lions Drag Strip in Long Beach, CA, and Ron Hampshire is driving. 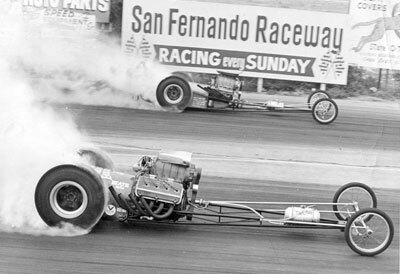 This picture was taken at the 1963 NHRA Winter Nationals at Pomona Ca. 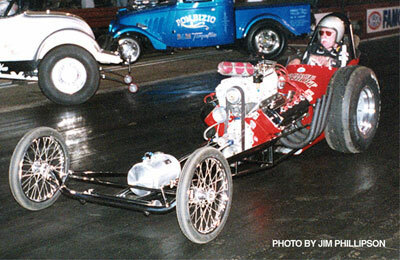 This was the first national event for this car. And it qualified in a field that included some of the fastest in the country: Jack Chrisman, Gordon Collet, Danny Ongais, and the Peters and Frank twin-engine "Freight Train". 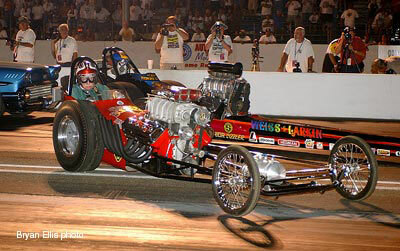 The little Chevrolet was over matched this time, and the "Freight Train" won this meet at 178.21mph and 8.82 sec. elapsed time. 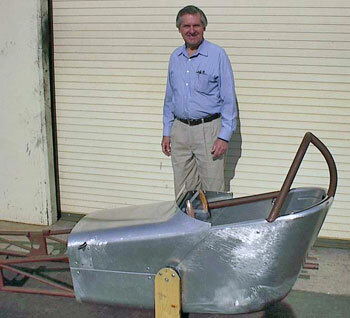 The car was a standard Fuller "light weight" chassis. The wheelbase was 112 inches and the car weighed 960 lbs. 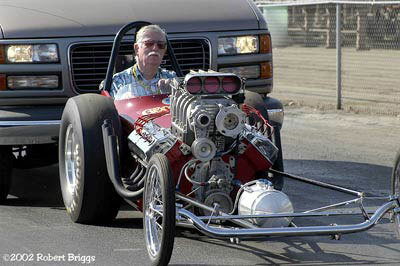 The original engine was a 339 Cubic Inch Displacement (CID) Chevrolet small block, equipped with a 6-71 supercharger. The car classed as a A/GD started out running 172 mph with an elapsed time (ET) of 9.00 seconds. By the end of 1963 the speed had risen to 181 mph with an ET of 8.40 seconds. The little Chevrolet ran well, setting records and winning a lot of races; but it was unreliable. The car lost races when the engine broke. 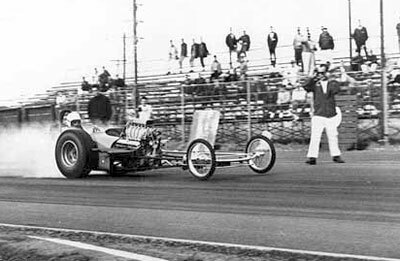 In 1964 Bolthoff made the switch to a stroked early model 392 Chrysler hemi that moved him into the AA/Gas Dragster class. It was with the Chrysler that Bolthoff got his signature "idle lope" that was very distinctive from the cars it competed against. 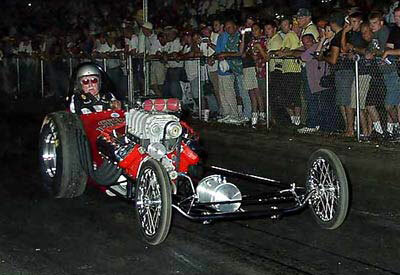 Later he was to admit it was simply a combination of his custom Engle cam design and the idle circuit on the Enderle injectors. By 1965 Bolthoff had broken the national AA/GD speed record three times and consistently ran in the 190 range. 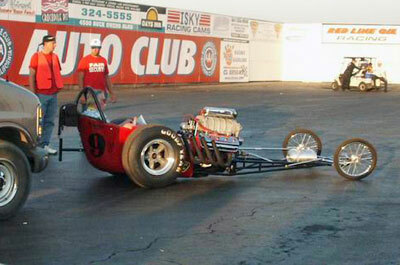 In fact he held track records at Lions Drag Strip, Inyokern, Fontana and Riverside. 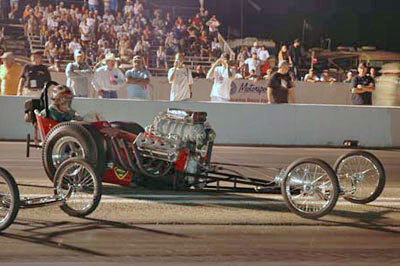 On the national level he held the record at Indianapolis Raceway Park and Milan, Michigan. 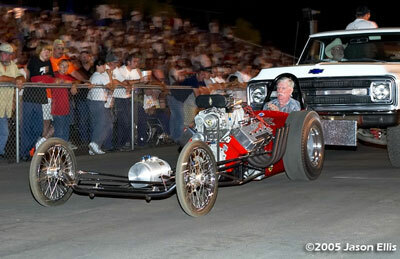 This car also held the B/GD Standard 1320 record and the A/GD record at the same time. 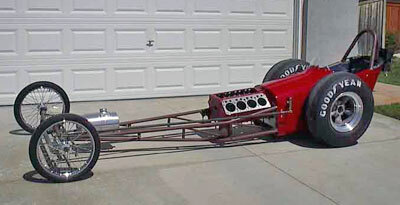 The B/GD record (8.40 @ 180 mph) was with the Chevrolet engine. Bolthoff then changed to the Chrysler engine and set the A/GD record. 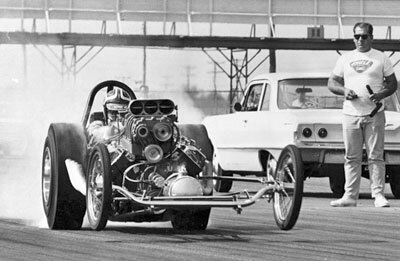 The last Standard 1320 record we can find was 8.34 and 191 mph, in the Oct. 1965 issue of Drag News. While winning an NHRA national event proved to be an elusive task for George Bolthoff during his lengthy career, he did manage to win 160 other Top Gas titles in his time, which made him one of the most respected campaigners of his era. 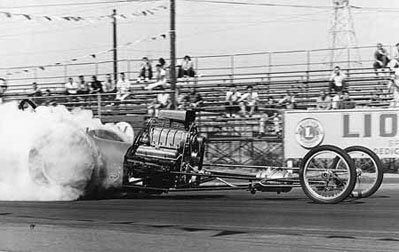 Among Bolthoff's more memorable accomplishments was his win at the 1965 World Series of Drag Racing race in Cordova, Ill., a pair of runner-up finishes at the Bakersfield March Meet, and several AHRA national event wins. 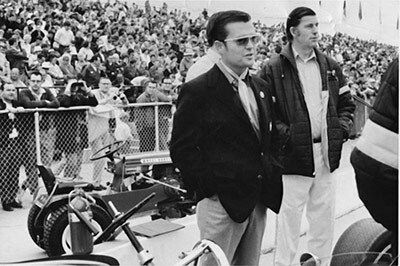 Financial considerations ended Bolthoff's driving career at the end of 1966, but he went on to work for Traco Engineering, where his clients included Roger Penske and Dan Gurney. He joined McLaren in 1967 to work on the aluminum big block Chevy engines for Can Am competition and Indy 500 Turbo Offys. 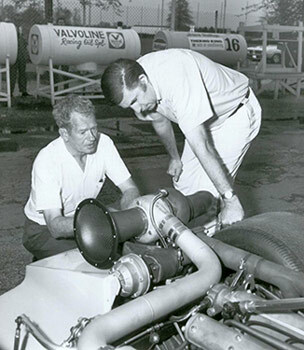 In 1970, Bolthoff opened his own engine shop to build engines for NASCAR short-track cars, Formula 5000 vehicles, and marine applications. Since 1980, he worked at Beckman Instruments as a computer programmer from where he retired. 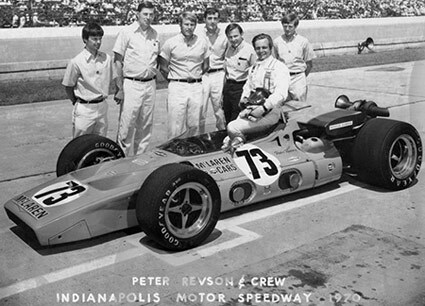 Bruce McLaren and Bolthoff at Indy with Team McLaren in 1970. George and Herbie Horsepower. That is the nickname for Herbie Porter. 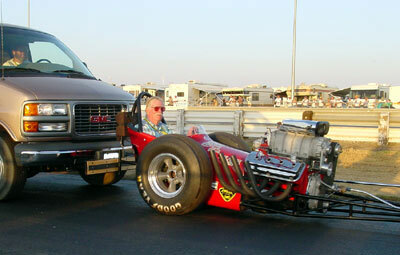 He owned Speedway engines and was a highly respected Indy engine builder. With the advent of Cacklefest the bug once again bit a retired George Bolthoff. 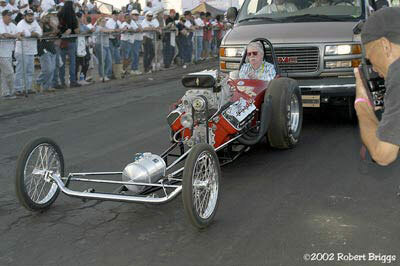 He was unable to find his gas car so he, being the original owner/driver had every right to recreate it. So in early 2002 he set about to do just that. From the chassis to the engine Bolthoff basically built the entire car, other than the body, in his garage at home by himself. The body was done by Doug Kruse who did the original in 1962. 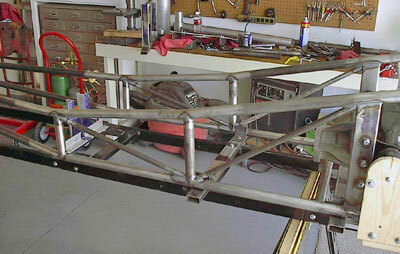 The completed chassis in Bolthoff's garage in 2002. The original body builder, Doug Kruse with the re-do 40 years after the first. The car itself was finished in the Spring of 2002. The engine soon followed. "Lonesome George" Bolthoff made his popular Cacklefest debut in 2002. Bolthoff in the Pre-Cacklefest parade and push starting. 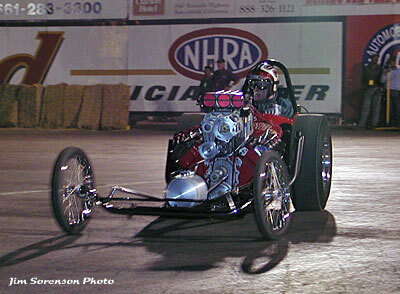 Push start for the 2003 NHRA Winternationals Cacklefest. Bolthoff in his spot for the 2003 CHRR Cacklefest. On display on the CHRR "Memory Lane"
Pushing out for the 2005 Pre-Cacklefest parade. Going to the top end and push start in 2004. When its not at the CHRR or doing a special event Bolthoff's car is on display at the Wally Parks NHRA Motorsports Museum.